It came in a plain brown wrapper, no returnÂ Â address--an audiocassette recording of a horrifying,Â Â soul-lacerating scream, followed by the sound of aÂ Â childlike voice chanting: "Bad love. Bad love.Â Â Don't give me the bad love... ". For AlexÂ Â Delaware the tape is the first intimation that he isÂ Â about to enter a living nightmare. Others soonÂ Â follow: disquieting laughter echoing over a phoneÂ Â line that suddenly goes dead, a chilling act ofÂ Â trespass and vandalism. He has become the target of aÂ Â carefully orchestrated campaign of vague threatsÂ Â and intimidation rapidly building to a crescendo asÂ Â harassment turns to terror, mischief to madness.Â Â With the help of his friend LAPD detective MiloÂ Â Sturgis, Alex uncovers a series of violent deathsÂ Â that may follow a diabolical pattern. And if he failsÂ Â to decipher the twisted logic of the stalker'sÂ Â mind games, Alex will be the next to die. 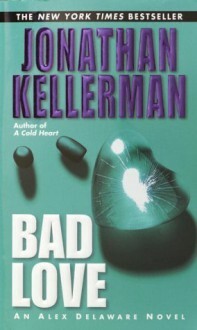 Taut,Â Â penetrating, terrifying, Bad Love isÂ Â vintage Kellerman.Also available on BDD Audio Cassette. Incredibly boring. I was pretty much only interested in the Frenchie. Not enough Milo, too much Alex just hanging around with Robin. It's sad when you only continue with a series because of a supporting character and (generally) interesting crimes. Readable story about a psychologist who finds himself in the middle of murder. Unsure who is doing it and having plenty of suspects it's still a shock when the actual culprit is unveiled! This is my least favorite Dr. Delaware novel, and I have to admit it's because I don't like Robin. There, I said it.